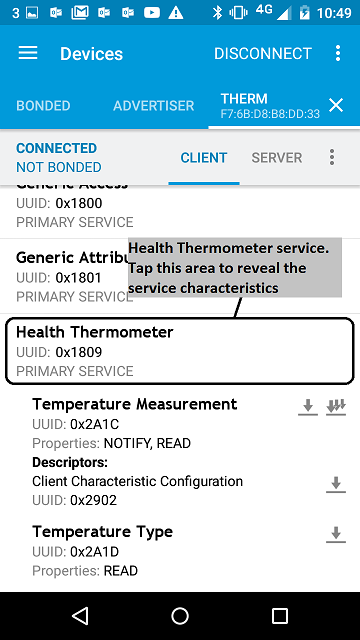 Sensor location: thermometer placement on the body. The default value in this application is the ear (``LOCATION_EAR``). The characteristic description shows the other possible values. Temperature: the initial temperature is 39.6, and it's incremented by 0.1 every half second. It resets to 39.6 when it reaches 43.0. Temperature Service: GATT profile details. Temperature Measurement: GATT characteristic details for temperature measurement. Temperature Type: GATT characteristic details for temperature type (sensor location). 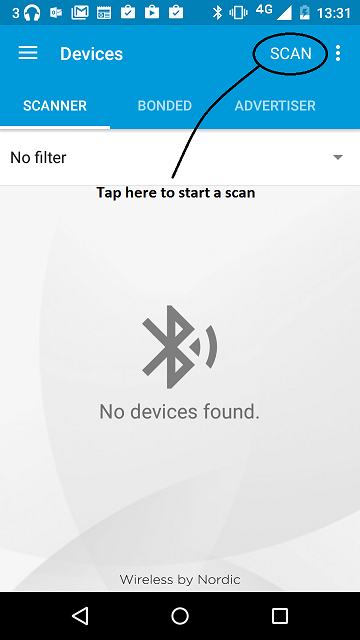 Note: Screens captures depicted below show what is expected from this example if the scanner used is *nRF Master Control Panel* version 4.0.5. If you encounter any difficulties consider trying another scanner or another version of nRF Master Control Panel. Alternative scanners may require reference to their manuals. 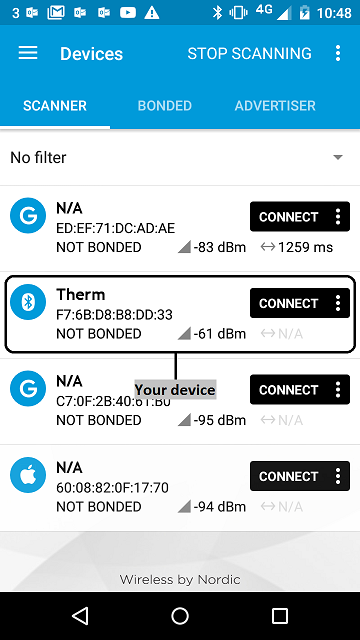 Find your device; it should be named *Therm*. 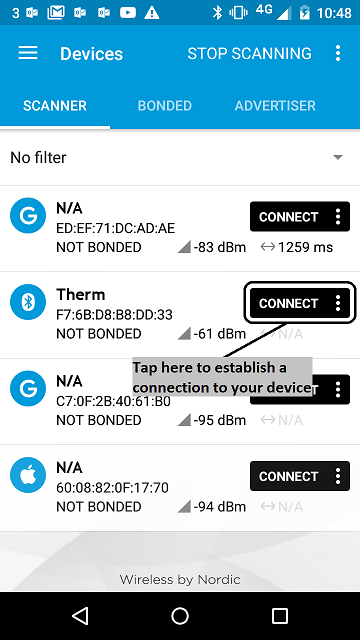 Discover the services and the characteristics on the device. 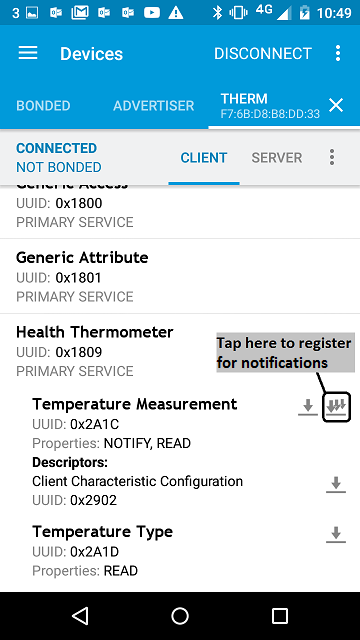 The *Health Thermometer* service has the UUID `0x1809` and includes the *Temperature Measurement* characteristic which has the UUID `0x2A1C`. 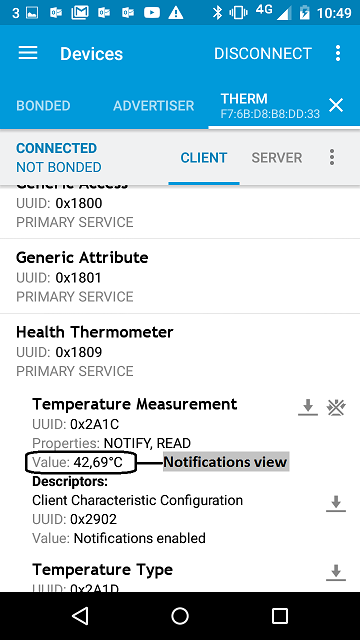 Register for the notifications sent by the *Temperature Measurement* characteristic. You should see the temperature value change every half second. It begins at 39.6, goes up to 43.0 (in steps of 0.1), resets to 39.6 and so on.